The result presents the performance of the candidate in this recruitment examination. Only those aspirants who have qualified the first tier will be allowed to join the second tier and so on. The official authority i.e. staff selection commission will disclose the SSC CHSL Result 2018 in the online mode. The candidates can easily find their result here. The declaration of the result is followed by the merit list and the final recruitment. • The exam official body will announce the result in the online mode. Therefore, the candidates can easily check the same. • An extreme care is taken while preparing the result of the candidates hence, the disclosed result will be the final on. Request for its alteration will be not be entertained by the official authority under any circumstance. • To check the SSC CHSL Score Card 2018 easily, the candidates can follow the link which will be published here soon after its official release. • The result is expected to be available in the pdf format. So, the candidate just needs to click the link and the result will appear on their display screen immediately. • The aspirants can keep the result safe and secure as it will be useful for the future reference. • Those candidates who have scored the good marks in the examination will be included in the merit list. • The merit list comprises the candidates in the decreasing order of their marks. • The candidates can easily obtain the same soon after its official publication. • Also, the merit list published by the official authority will be totally based on the announced SSC CHSL Result 2018. • Only those candidates who have their names in the merit list shall be considered for the final recruitment. • The official authority i.e. the staff selection commission will publish the merit list only in the online mode. While preparing the merit list, it may be possible that two or more candidates have scored identical marks in the exam, hence the tie between the two can be resolved by using the tie – breaking procedure one after another. • First of all, the tie between the two can be resolved by using the scores in the first part of the written examination. • Secondly, the age of the candidates will be considered. The aspirant with higher age will be preferred over another. • Finally, the tie between the candidates will be resolved by preferring the alphabetical order of their names. Shri Ram College of Commerce (SRCC) is one of the premier commerce and economic institutes in India. Shri Shikshayatan College in Kolkatta is a self financing co-educational college. Sivanath Sastri College was established in the year 1955 by Ananda Mohan Bose. 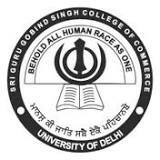 Sri Guru Gobind Singh College of Commerce (S.
Nowadays, where technical and management courses are making buzz, at the same time BA, B.